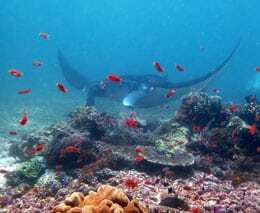 Raja Ampat Aggressor: Raja Ampat, Komodo, Banda Sea & Derawan Is. 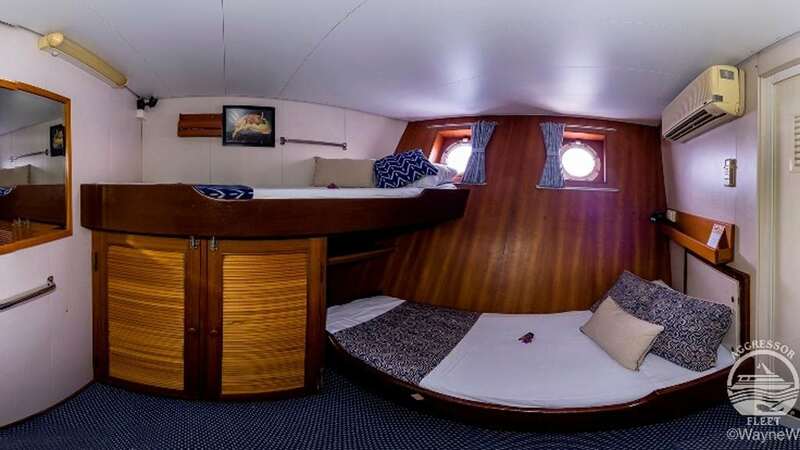 Raja Ampat Aggressor Liveaboard, formerly known as Ocean Rover, is custom-built with the needs of divers in mind, very comfortable with many unique, practical features to make all aspects of life on board easy and safe. 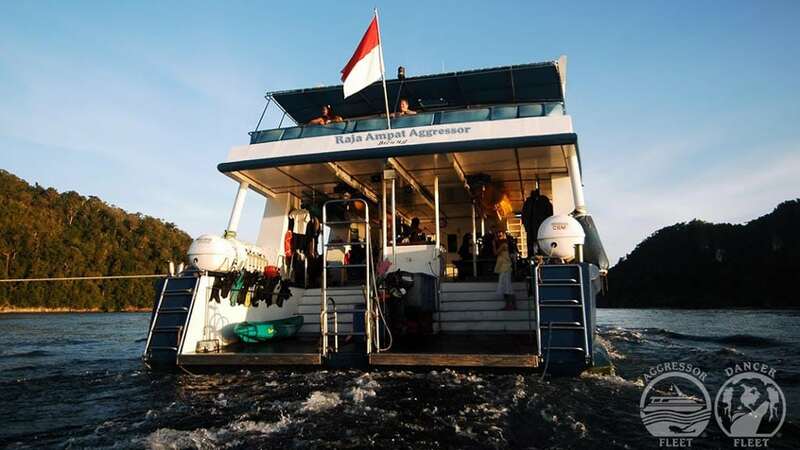 Raja Ampat Aggressor operates 7 to 12-night cruises in Raja Ampat, Banda Sea, Triton Bay and Derawan Islands. 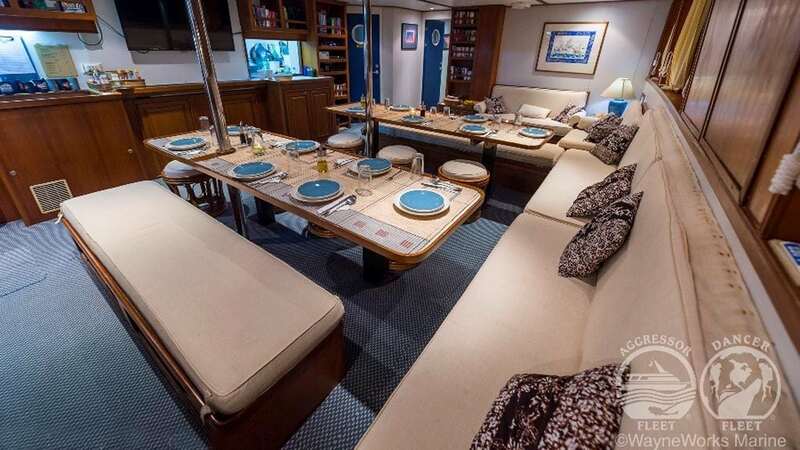 All cabins have either picture or port windows, private en suite bathrooms, individual climate control, TV/DVD, bathrobes, hair dryerand220V power. 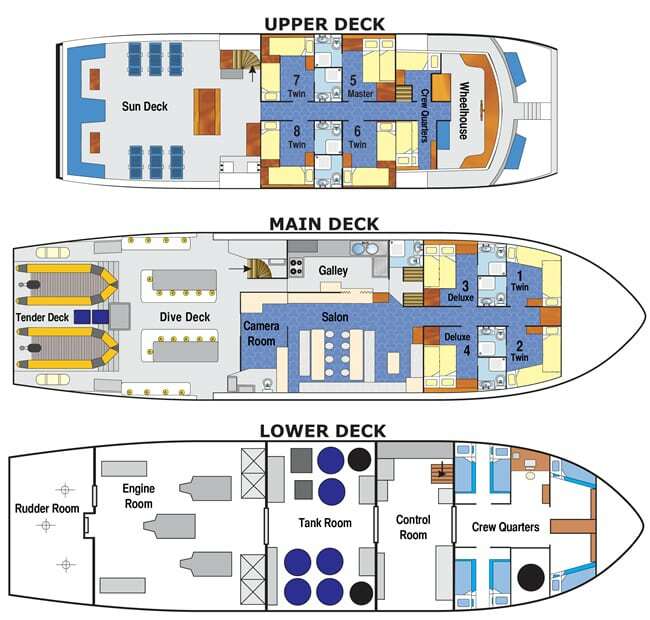 A partially covered sun deck is offered with chaise lounges, a complete wet bar, CD Stereo player and BBQ grill area. The entertainment centre features a TV, DVD and an assortment of movies and books. 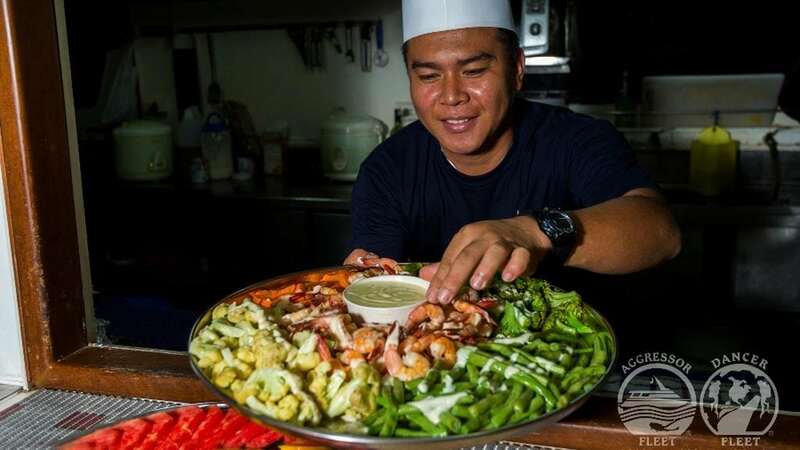 The menu on-board is varied and plentiful, with a variety of Indonesian meals and local cuisine. Special dietary needs can be catered for. You will awaken to a fresh breakfast with fruit, hot entrees, cereals and juices. Lunches are buffet-style and dinners are served each evening. 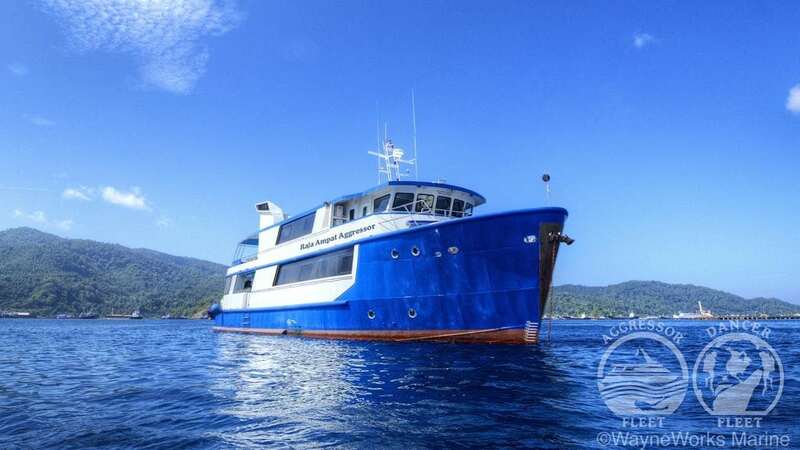 Raja Ampat Aggressor offers up to 4 dives per day (inclusive of night dives). 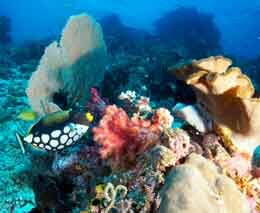 While onboard, you may pick a dive buddy of your choice, or dive with one of the crew members. 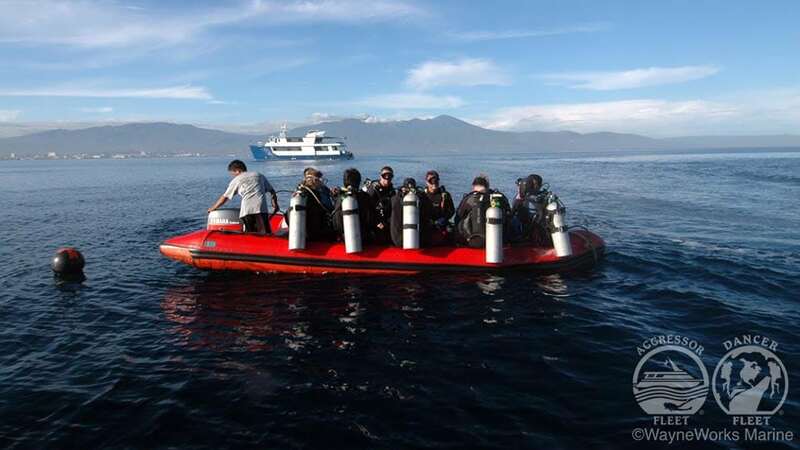 All diving is done from two dive tenders and the ratio is usually 1 guide for 4 guests, with groups spread out slightly so there’s no crowding. The vessel provides 10L (80cu ft.) tanks with DIN/Yoke adaptable valves, weight belts and weights. 12L (100 cu ft.) tanks are available on request and Nitrox is available at extra charge. 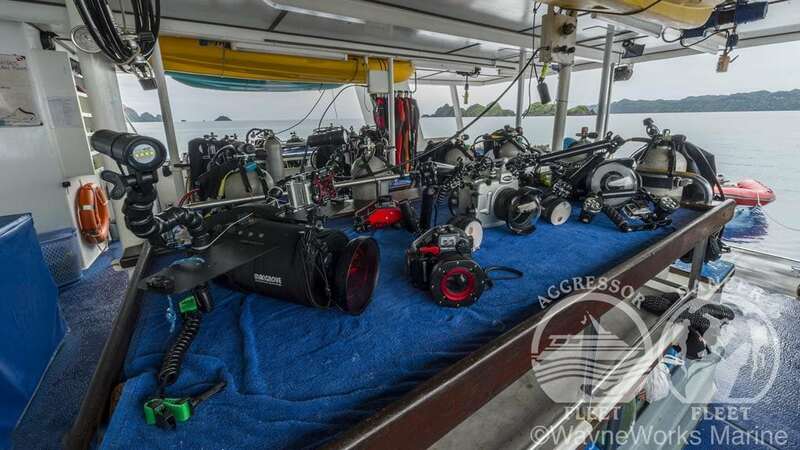 A full line of Aqualung rental gear is available onboard. A 3mm wetsuit is recommended. 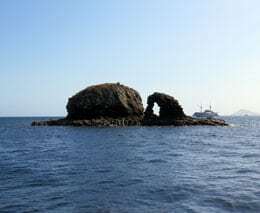 Water temperature varies from 28-30°C (82-86°F) and air temperature ranges from 25-27°C (77-80°F). Several specialty courses are on offer including Nitrox, Advanced Open Water, UW photography and more. A comprehensive first aid kit and medical supplies are on-board including DAN Oxygen system with 100% demand regulator and automatic external defibrillator (AED). A full complement of safety and rescue equipment including life jackets, life rafts, rescue raft and emergency flares is also provided. The vessel offers a complete digital photo department. A‘Photo Pro’ is available for free coaching with equipment rental. 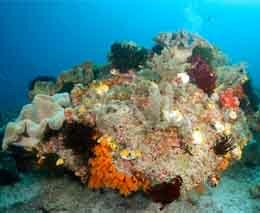 Raja Ampat Aggressor has a 110V strobe charging station and a large camera table available for all your camera and video equipment. Guests should bring their own battery chargers. 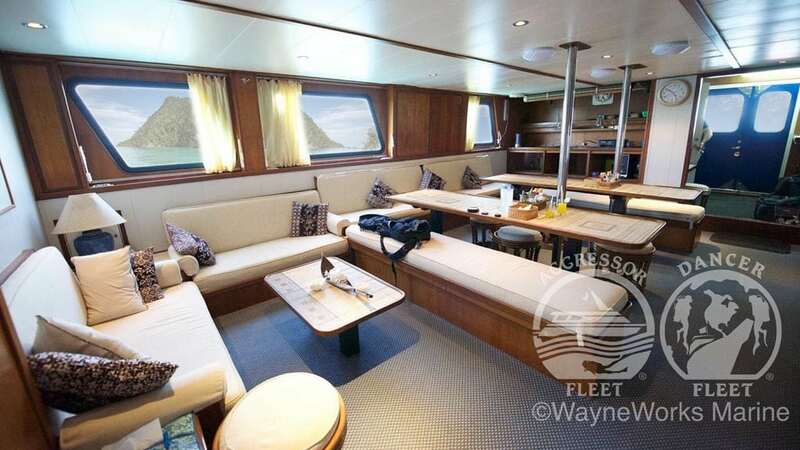 The Raja Ampat Aggressor has a variety of itineraries which include Raja Ampat, the Banda Sea, Komodo and Flores and all the way over to the west – the Derawan Islands on the edge of the continental shelf of East Kalimantan – one of the few liveaboards with such an extensive offering. 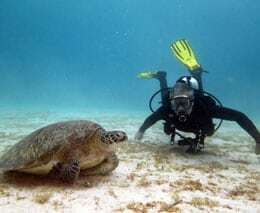 Each of these itineraries offers a range of exciting diving and provides the opportunity to try a different area every time. There is a satellite phone on board for emergency communication only. Please note that there is no WiFi available. 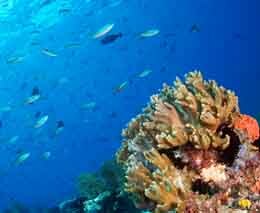 Raja Ampat Aggressor provides a great service, high standard and of course truly amazing diving across a wide variety of itineraries. 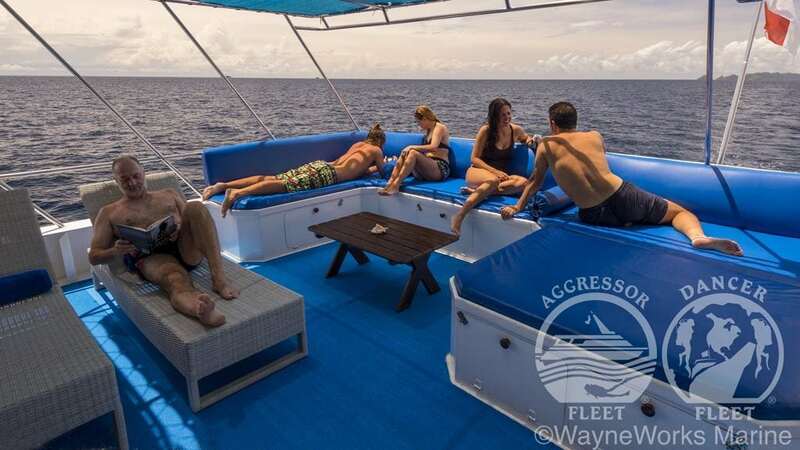 Please use the [Enquiry & Booking] button to give us your exact requirements in terms of Trip#, dates, number of divers/snorkelers, and we'll give you the best deal we can.